See MCRC1 Series Works with virtually all pull-chain fans. Non-reversing fan and light control. Battery operated. See MCRC3 Series Works with virtually all pull-chain fans. 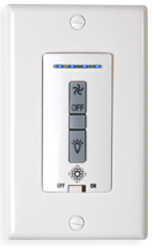 Non-reversing fan and light control.